Nagpatong Rock is now becoming popular to those mountain seekers both professionals and hiker-wanabes (like me). It is composed of two peaks facing each other which reminds me of the 2nd installment of the epic movie Lord of the Rings, The Two Towers. Located in a humble barrio of Barangay Cuyambay, Tanay, Rizal, this rock formation looks so perfect that entices you to reach it no matter what it takes. But mind you, these two towers of rock can be more tricky than you might think. So if you have a slightest doubt or having a second thought that you might fall, I suggest not to climb the summit. Derived from its name, “Nagpatong” or “Patong” which means in Filipino a layer placed on top of the other (http://tagaloglang.com/patong/), the view of the rock formation from afar looks like stacks of rectangular rock put on top of the other creating what looks like to be a tower rising above the jungle. The other peak looks a ball of rock on top of a rectangular base. True enough, the scene atop is just stunning, like no other. But beware, taking the climb up to the summit is never easy. Great precaution must be exercised. Exactly 1:00 P.M. we began to march. 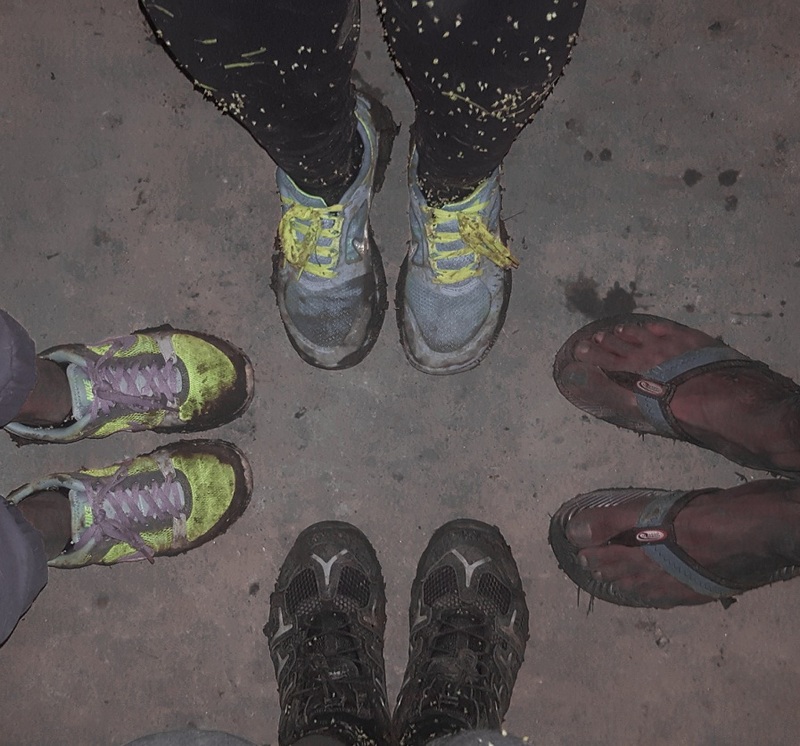 From jump off to the start of the assault took us about 1 and ½ hour of mud, grass, and bamboo trail. Then we started our assent (experienced hikers can reach it in less than an hour). You’re halfway to the first peak when you climb a tree. If you have not done that yet, a bit of practice before hand will be of help. Then you will have to use a rope to reach the top of the first tower. We were battered by strong wind when we get there which made it more knee-trembling and heart-pounding experience. I felt like Gandalf the grey trapped at the top of Saruman’s tower and there’s no way out but to fall. Facing from the first tower to the east is the second summit. This is more like the Mount Doom where the ring of power was purge and where it should be destroyed. In my opinion, the way up to the second tower is easier compare to the first one. However, and I say it again, I couldn’t stress it more enough that a single mistake or wrong step will definitely cause your life. There is no joke on that. We can’t help ourselves but cheer, have fun and enjoy the beautiful creation and taste the feeling of success the moment we reached the second summit. I believe you would agree with me that there is no greater fulfillment when you reached the peak of the mountain. At the summit, few kilometers north you can see the giant cob web of Masungi Georeserve. Another great adventure to do but getting a reservation is more challenging than the activity itself. By 5pm we started our descent. Trust me, you don’t want to leave there after dark. That is equal to suicide. Bottom line, Mt. Nagpatong Rock formation is generally easier in terms of trekking. Extra cautioun is a must when you started your way up to the summit. Strong will power, focus, presence of mind and awareness of what will happen if you make a wrong step will give you the adrenaline. Finally, trust and support from your friends and guide can give you courage to complete the climb. If you want something extreme this is definitely for you. From Farmers Plaza in front of Jolibee take UV Express Van (Php.35.00 per person) going to Cogeo or Jeepney ride (Php.24.00) along Aurora Blvd., underneath Araneta Center Cubao LRT Station. Ride a habal-habal (Php.25.00) going to Brgy. Hall for registration and secure a guide. Another habal-habal ride going to jump off site (Php.40.00). **This was when we first hike, but since Tanay government now managing all tourist/hiking site in the municipality, it is now Php.100.00, all accross Tanay. Cellphone signal is generally acceptable. There are some locations along the trail that you will not pick up a signal. Wear clothes that are not easy to tear. There is so much spikes on the rock. No hikers are allowed to go to Nagpatong rock after dark. Wow! Incredible what you guys did. The view must be fabulous! Thanks for sharing. “However, and I say it again, I couldn’t stress it more that a single mistake or wrong step will definitely cause your life. There is no joke on that.” – we really can’t stress this enough! Haha. Thank you. @salingkatkat… I can’t wait for our next climb beshie. More more more fun!